Some may believe that the holidays aren’t the right time for a home renovation — but you’ve got the time off, so why not? 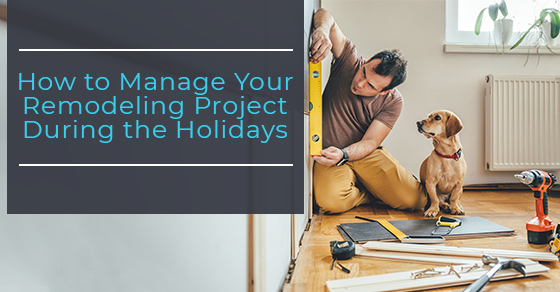 You’ll be glad to know that there are definitely ways to make it work, so if you’re thinking about planning a renovation this holiday season, read on for some tips on how to manage your project. Celebrating the holidays usually requires some special tasks in the kitchen. During your holiday, make sure you have a plan in place to manage them. For example, the chances are you’ll be attending a potluck or need to do some baking for the children’s school party. Find some local bakeries and restaurants where you can order prepared food if your kitchen will be out of commission. Another thing to consider is package deliveries. If you are out of the house when holiday gifts arrive by mail, do you want your contractors answering the door and signing for your holiday packages? If so, let them know where to put the deliveries. If not, arrange to have them sent to your work or a friend’s house. Contractors tend to work regular business hours so they cause the least amount of disruption during the remodelling period. Speak to your contractor about their regular hours, as well as when they will be taking a break over the holidays, so you can make sure there won’t be any issues with your schedule. If there are, you will have time to make sure proper arrangements are made. While contractors do their best not to interfere with your daily routine, sometimes a little noise and dust are unavoidable. You will have to be willing to compromise to make things work while you are sharing the space. Some of the things you should speak to them about up front might include where they will store their tools and materials, where they can travel in the home beyond the areas they are remodelling and even setting up a designated break area you both agree on. You want to make sure that everyone knows what to expect during the process. Keep in good communication with your contractors so you are aware of any major inconveniences that might affect family and neighbours. For example, if they are planning to receive a major delivery that might have trucks blocking the road, or if they will be doing something particularly noisy, be sure to let others know. To learn more about remodelling your home during to holidays, call Avonlea Renovations at (416) 907-4764 or contact us here.